You might have noticed sometime that Facebook is trying to force you to use it's messenger app. Most of the people are not happy with this behavior of Facebook. If you're using Facebook's messenger app to send and receive messages then observe one think that you can't log out from it. Facebook has not provided any direct log out button in it. This is quiet unfair with the users. May be Facebook doesn't want that people stop using it and uninstall it from their Smartphone. No doubt that Facebook messenger is the most easiest and comfortable way to connect with your friends, colleague and family members but you don't wanna stay active all the time. This is the only feature which should be added in the app regarding the next improvement update. 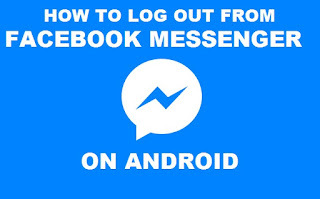 But don't worry there's a way to logout from the Facebook messenger app on android. It might be a little difficult task to think about it for a non technical person. Below is a step by step mentioned guide, follow it to log out from messenger android app. First of all you need to remove Facebook messenger from the recent apps tray. Just press the home button (There can be any different button or option to show recent apps for different Smartphone) on your Smartphone and remove it from recent apps. Now navigate to "Setting" in your Smartphone either from menu or just swipe down on your home screen and choose setting button. Search for "Apps" or "Application" in the setting menu. Click on it there you can see all the installed application on your Smartphone. Search for "Facebook messenger" and click on it. Then simply click on "Clear Data" button to clear app's data. That's it. You're logged out from Facebook messenger. Now you will see login screen again when you will open Messenger. This was all about how to log out from Facebook messenger on Android Smartphone. If you have any doubt or query then feel free to leave a comment below in the comment section.